If you are looking for a vest that you can attach to your guide dog's harness then this might be for you! This vest has 2 long straps that are long enough to wrap around the back strap of a guide dog harness. These straps fasten back onto the vest quickly and securely with industrial strength hook and loop. They also have a grippy material on the underside of them to help keep the vest from slipping. An adjustable, nonrestrictive elastic belly strap keeps the sides of the vest from flapping and offers a comfortable fit for your dog. This vest has three zippered pockets that are the perfect size for papers, meds, keys, cellphone and any other important items you may want to have your dog carry for you. The highly reflective stripes add visibility when you are out at night. 6 1/2" front to back x 21" side to side. Girth strap adjusts from 30" - 37" before stretching. This vest is versatile and easy to use. 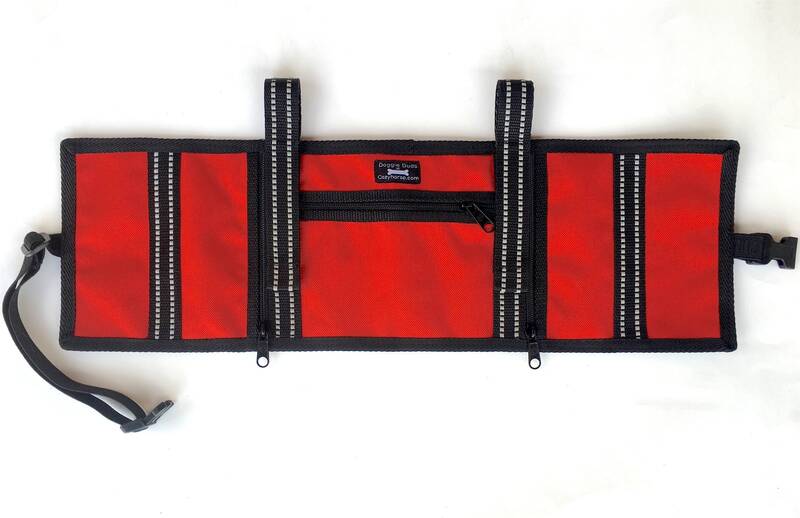 Shown on a guide harness made by Hilason and also on a guide/mobility harness made by Activedogs. This vest will also work on Freedom harnesses, Easywalker, Bridgeport guide harnesses and many others. We love it!! Thank you! Looks amazing and functions perfectly! I couldn’t be more satisfied! And my custom buckle and clips were so helpful with my rheumatoid arthritis hands! Can’t wait to add more patches!